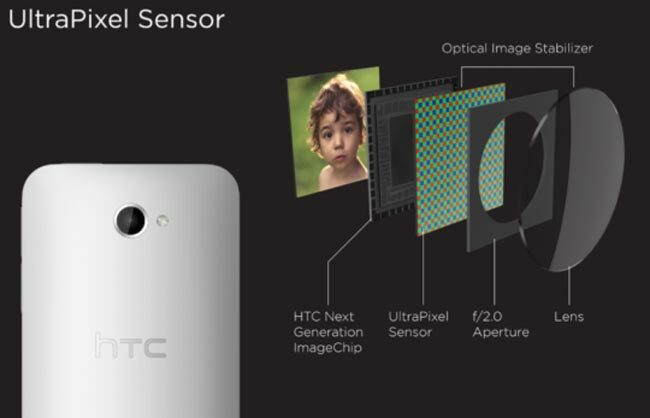 The HTC One features a new camera sensor, which HTC calls an Ultrapixel sensor, and now they have released some more details about this new sensor and how it works, according to HTC it can capture up to 300 percent more light than the top 13 megapixel sensors. The sensor on the camera on the HTC one is actually a 4 megapixel sensor, you would think that more pixels would make for better pictures, but the quality of pixels is what matters in capturing photos, details below on how it works. UltraPixel Sensor – Engineered with larger pixels, it enables each pixel to capture more than 300% more light than most leading 13 megapixel cameras. • HTC ImageChip – Offers continuous autofocus, color shading, and noise reduction, as well as more realistic High Dynamic Range. • F2.0 Aperture – The largest available on smartphone camera, it lets in 44% more light than the iPhone 5. • Optical Image Stabilization – Drastically reduces blur in still photos and shaky video footage. The HTC One features a 4.7 inch full HD display with a resolution of 1920 x 1080 pixels and 468ppi, processing is provided by a quad core Qualcomm Snapdragon 600 processor with a clock speed of 1.7GHz, have a look at some more HTC One specifications.